One of the most effective techniques for keeping your face clear and getting your skin healthy is through the use of the best face exfoliator. These products usually contain granules to properly clear out the dirt and dead skin from the pores of your face, leaving it fresh and clean in the process. Exfoliation is usually done with facials, but these procedures cost a lot of money, and they usually require a visit to the clinic. Even then, it could take several hours to complete exfoliation. Fortunately, you can also achieve the same results at home by using exfoliation products. For that, we’ve got you covered. As beauty bath products, all three scrubs are definitely top of the line. The ingredients used in each of these scrubs show that the manufacturers want the best for their consumers. Each of these products also holds specific advantages over the other. What are those advantages? Let’s find out! Here, we take a close look at three of the best face exfoliators. To save you the hassle of finding one that would suit you best, we have tried these products ourselves in order to give you honest reviews. Are you ready to start your journey to clear, youthful-looking skin? The M3 Naturals Activated Charcoal Scrub is made almost exclusively with natural products. Aside from activated charcoal, this scrub also contains stem cell and collagen as well as Dead Sea salt, juice from organic aloe vera, coconut oil, jojoba oil, spinach extract, and kukui nut oil. This makes for an effective mixture that is perfect for both oily and dry skin. Activated charcoal helps in trapping chemicals and washing it away, while Dead Sea salt contains skin-rejuvenating properties. For repairing and restoring skin, coconut oil is also added, which is a natural emollient. Aloe vera is a known antioxidant, and it contains vitamins and minerals that can help with dry skin and acne. 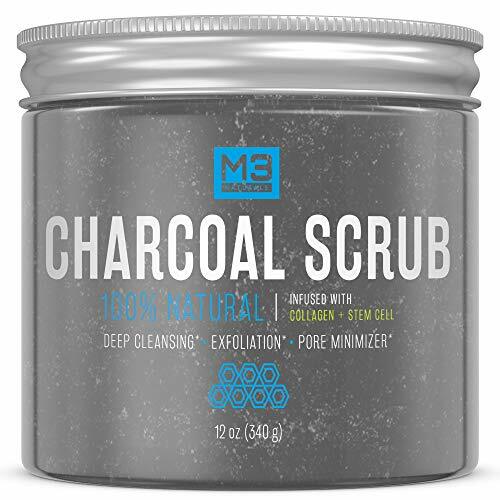 To use the M3 Naturals Activated Charcoal Scrub, simply apply a layer of the scrub to damp skin. Then, spread it around in a circular, rubbing motion. After the scrub has been applied to all parts of the face, wash it off with warm water. While this scrub is recommended for the face, it can also be used to exfoliate other parts of the body and be used as a body wash. If you wish to improve the effectiveness of this scrub, it is advised to use a body brush, which increases the scrubbing motion and helps stimulate circulation. 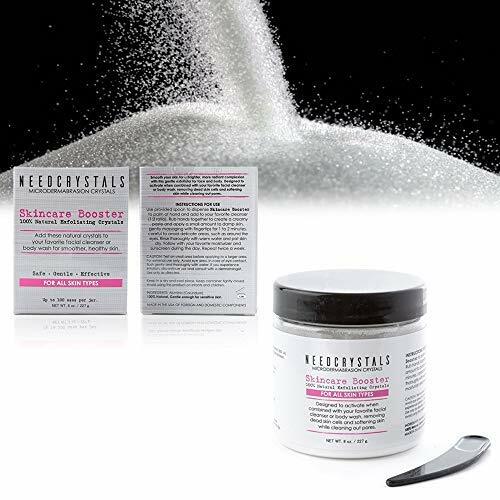 Microdermabrasion Crystals Skincare Booster is a high-quality scrub from NeedCrystals. It contains aluminum oxide that is believed to protect and rejuvenate the skin, resulting in the reduction of wrinkles and stretch marks. The aluminum oxide is found in perfectly round, 120-grit, pure white particles. The small crystals are made up of salicylic acid and help in exfoliating the skin. The cream is excellent in reducing blackheads, lightening acne scars, minimizing pore size, and improving skin texture. It is also an organic, non-GMO, and non-cruelty product. It comes in an eight-ounce jar that is guaranteed to last for up to 100 uses. In addition, it also comes with a special spoon so that you can accurately use the recommended amount for each scrub. Before using this product to exfoliate the face, clean the area with soap/gel/foam and water so as to remove dirt and excess oil. Then, rinse thoroughly with warm water. After that, mix a teaspoon of the crystals with two tablespoons of cream, gel, or oil. Use the mixture to massage your face in a circular motion for about three minutes. Once done, rinse using warm water. Finally, thoroughly pat the skin on the face with a clean, dry towel or cloth. 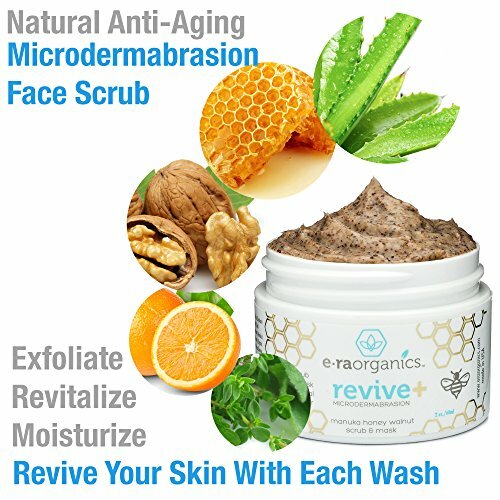 The Revive Microdermabrasion Facial Scrub by Era Organics is a sugar skin scrub that features natural ingredients. It has aloe vera to boost healing and rejuvenation, manuka honey to detoxify and balance out the pH levels of the skin, walnut and sugar cane particles to dislodge dirt and dead skin from the pores, and vitamin C that works as an antioxidant and to reduce damaging free radicals. This treatment boasts a gentler scrub than other exfoliators in the market. While most skin treatments can be abrasive and harmful to sensitive skin, this solution has a gentler and much more natural solution. To apply this facial scrub, use a dime-size amount and gently massage it over the skin for about one to two minutes. Then, rinse with warm water. After drying the skin with a towel, use the anti-aging mask. Leave the mask on for five to 10 minutes, then rinse your face thoroughly once again with warm water. Lastly, dry with a clean towel or cloth. When it comes to the complete package, the best product among these three has to be the NeedCrystals Microdermabrasion Crystals Skincare Booster. With these crystals, you will see and feel the difference after you exfoliate with the scrub. The scrub is made with natural products, so you don’t have to worry about ill effects on sensitive skin or certain skin types. Finally, the parts are more than the sum of the whole with this product. Each of the ingredients used in the scrub has a specific function in rejuvenating and cleaning your face and skin.